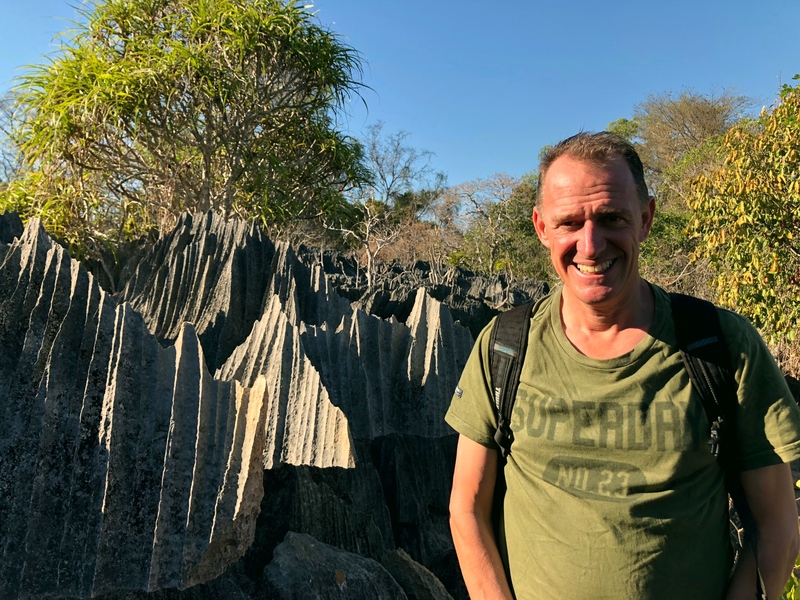 From Morondava our goal was Tsingy de Bemaraha National Park, a six- to seven-hour drive north. 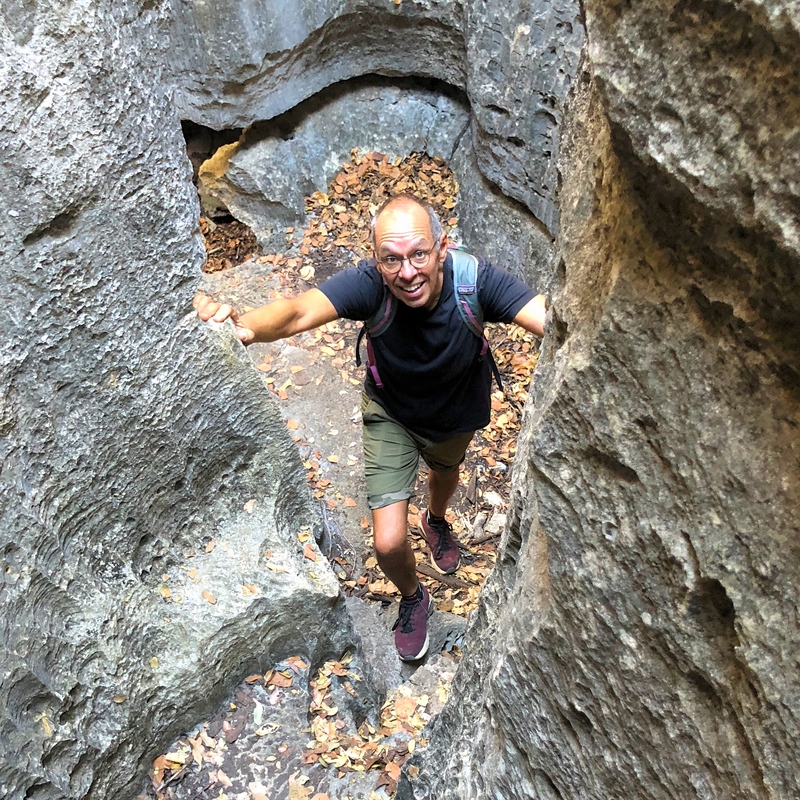 This UNESCO World Heritage site is made up of an almost surreal landscape of limestone karsts (essentially limestone plateaus) that have been eroded into caverns and fissures creating dramatic “forests” of sharp limestone needles. Utterly unlike anything we’ve seen before. 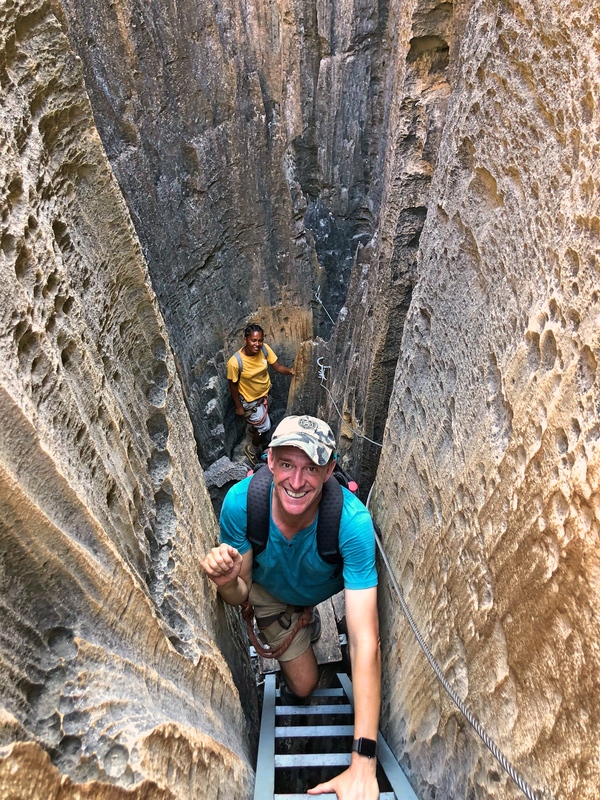 On top of the unique geological formations the park has an unusually large number of endemic species of both plants and animals, some existing nowhere on earth but in these karsts. 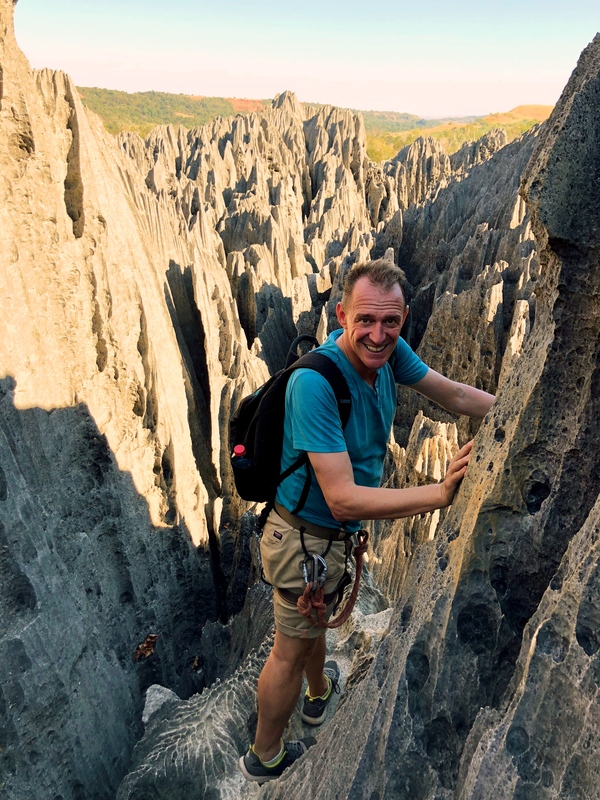 One thing that these pictures can’t (or at least don’t) display is how almost stunningly sharp the rocks were. 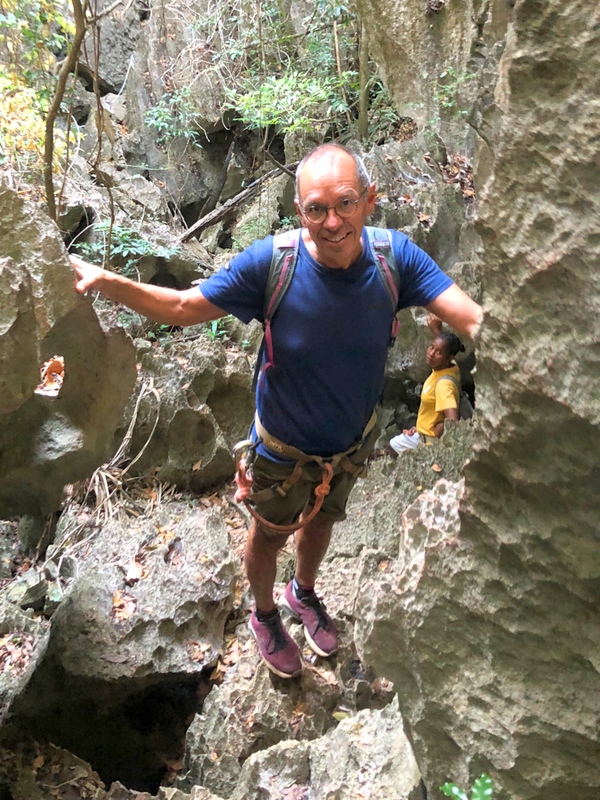 As we spent three days tramping around the park with Francia, our local guide, much of the time was spent either walking through forests or through caverns. 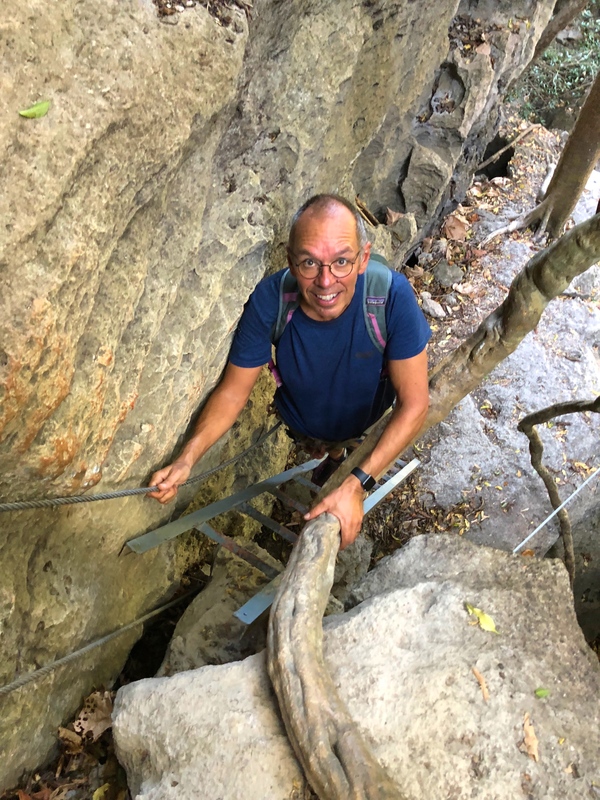 When we were actually climbing on the “tsingies”, though, you had to be genuinely careful where you placed your hands; it wasn’t quite knife-edge sharp but the tops were extremely hard and genuinely sharp. Let’s put it this way: if ever you were to slip and fall while you were in the tsingies you would be in a world of hurt. 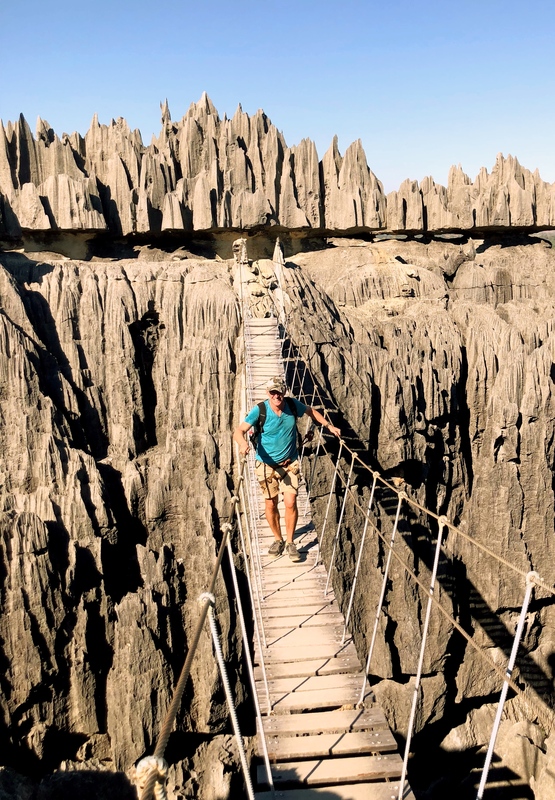 At least one definition of tsingy is “where one cannot walk barefoot.” To say the least! 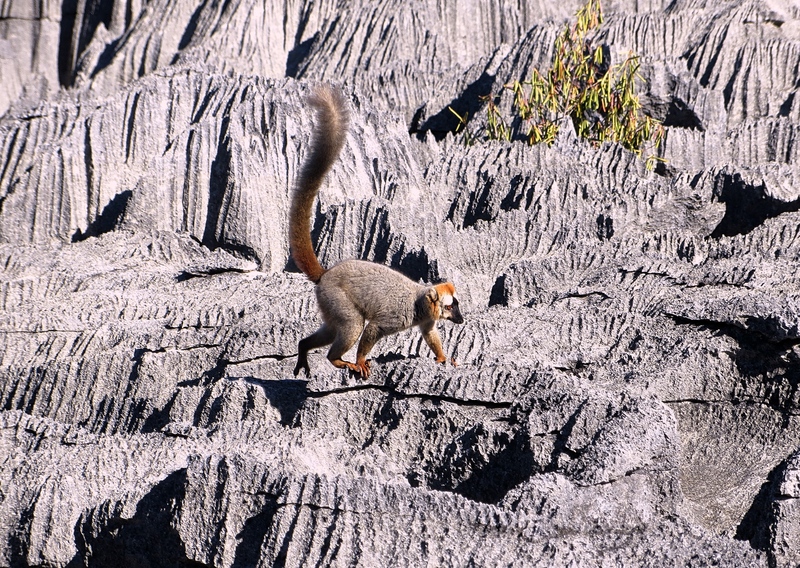 Which made one of the sights we experienced particularly interesting: a group of lemurs hopping across an expanse of tsingies. (Tribe of lemurs? Family? OK, I looked it up and on one site they’re called a troop of lemurs while two other sites call them a conspiracy of lemurs. I’m going with conspiracy.) Francia seemed genuinely impressed; she indicated you rarely see lemurs on the tsingies themselves. 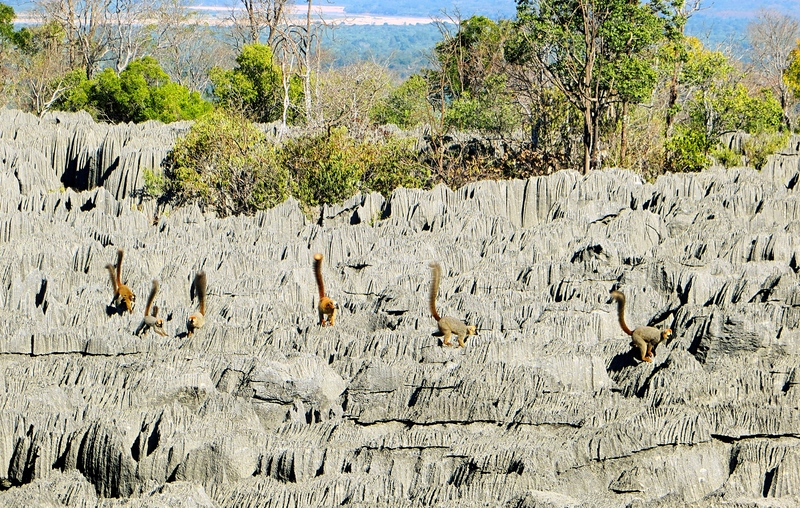 A conspiracy of lemurs crossing the tsingy. I pitied their poor feet! 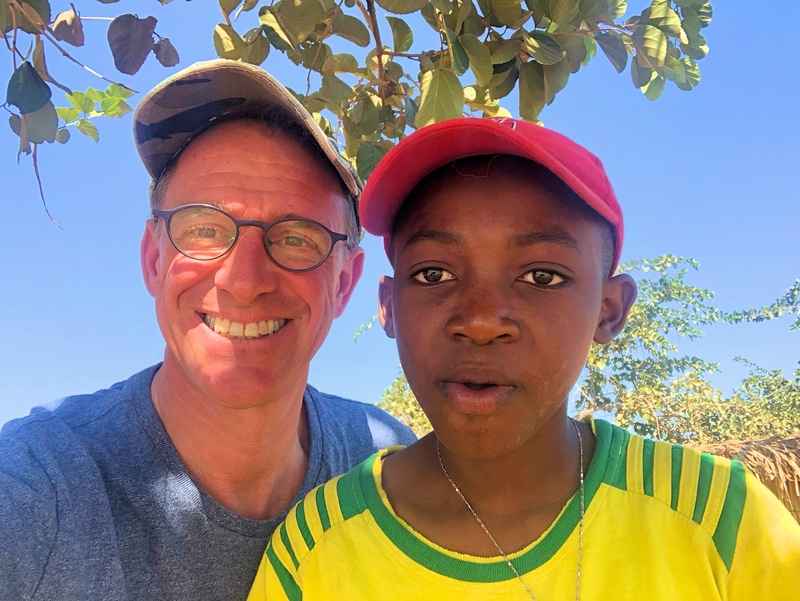 Both getting to the park and then getting back to Morondava was quite the experience. 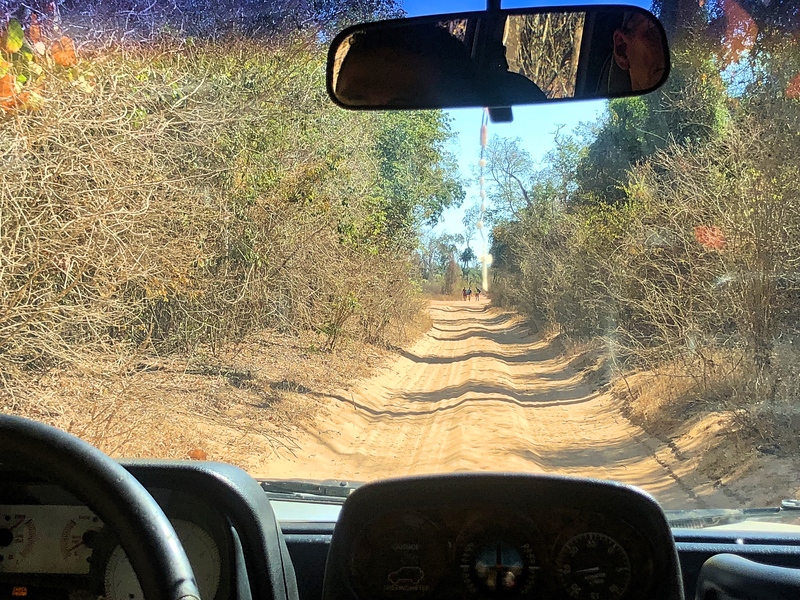 As I indicated, it was something like a seven-hour drive up there, nearly all of it on gravel roads and much of it on roads in really rough condition. 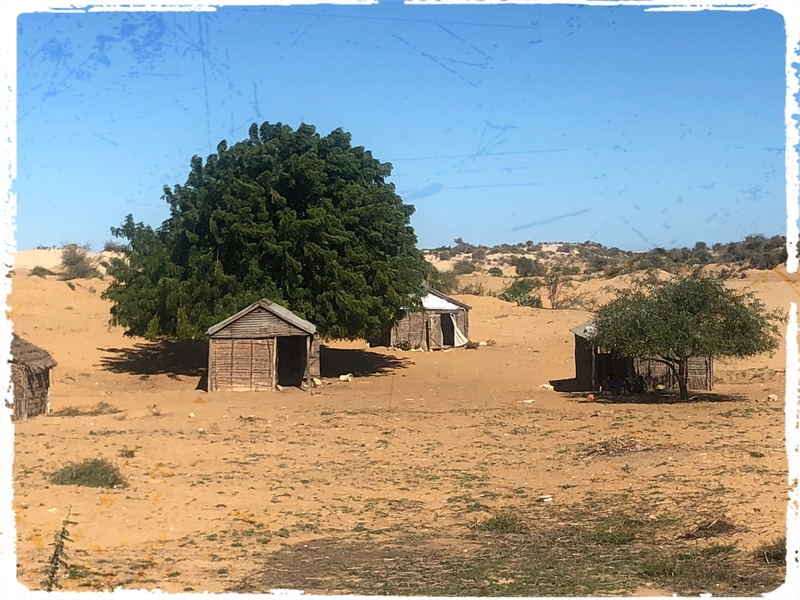 For a long stretch – a few hours – we seemed to be traveling in a caravan with maybe a dozen cards packed together kicking up an astounding amount of dirt. We had the windows open and after a while you couldn’t believe how dirty we were, just crusted in dust. At one point, then, our car managed to break down, a broken fan belt or something. 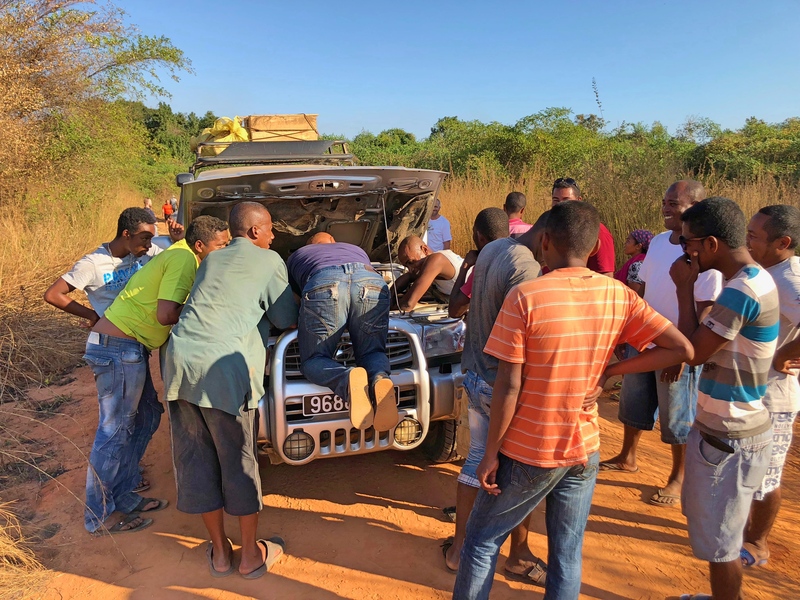 I figured that explained the caravan, as every single car in the group – even those in front of us – stopped to help. It took maybe 20 minutes to get us going again, with every driver there to help. My guess was that no one wanted to break down alone which explained the caravan. Wrong. The collected drivers trying to fix our car. I was distinctly glad we weren’t traveling alone. Just before leaving our lodge for the drive back people we’d met over our four-night stay explained that just the week before thieves had ambushed a driver taking German tourists up to the park. Apparently beat him pretty badly and robbed the tourists. So now drivers were traveling in a caravan. And as we learned on the return drive, with armed guards in the first and last cars. We happened to be selected as the last car so we traveled for a couple hours with an armed soldier riding shotgun. Literally. 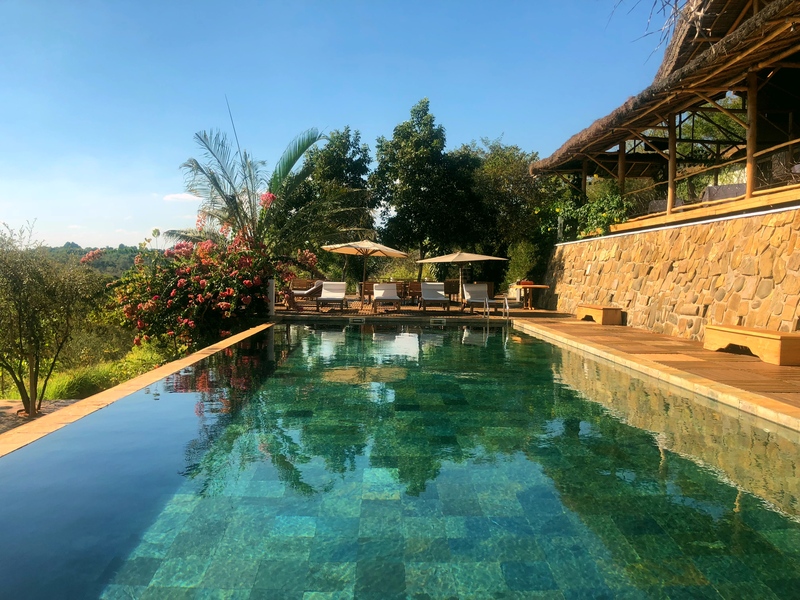 In the meantime as word got out about the robbery tourism was quickly drying up in the region which is a genuine tragedy for the people who make a living off the tourists. 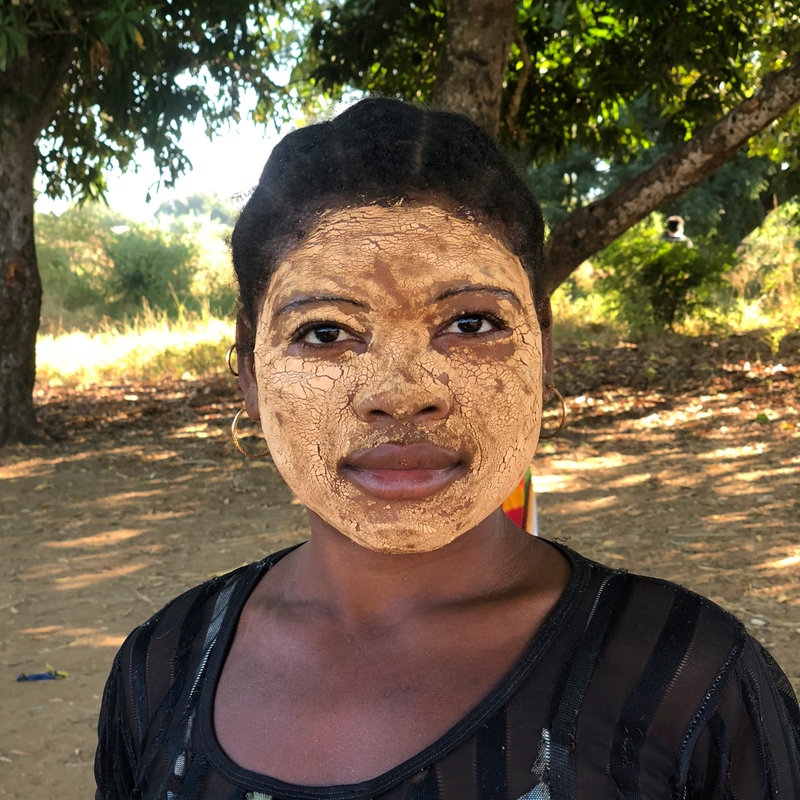 As we traveled through some of the poorest, most remote villages you might ever imagine, lots of women had their faces covered like this. According to our driver it was their way to keep from getting too much sun. 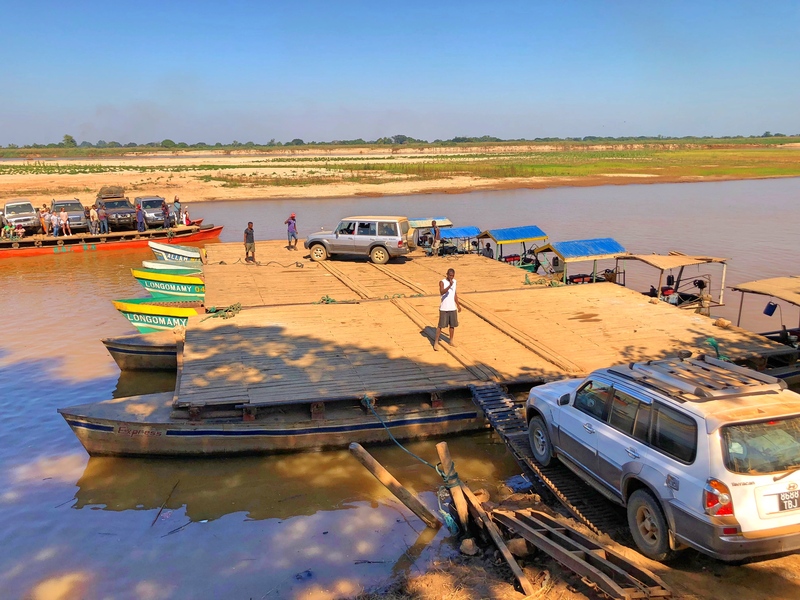 And then eventually, after in this case maybe an eight-hour drive, we made it back to Morondava. For the return trip our driver had upgraded the car to one with AC so we could keep the windows closed; made a big difference. 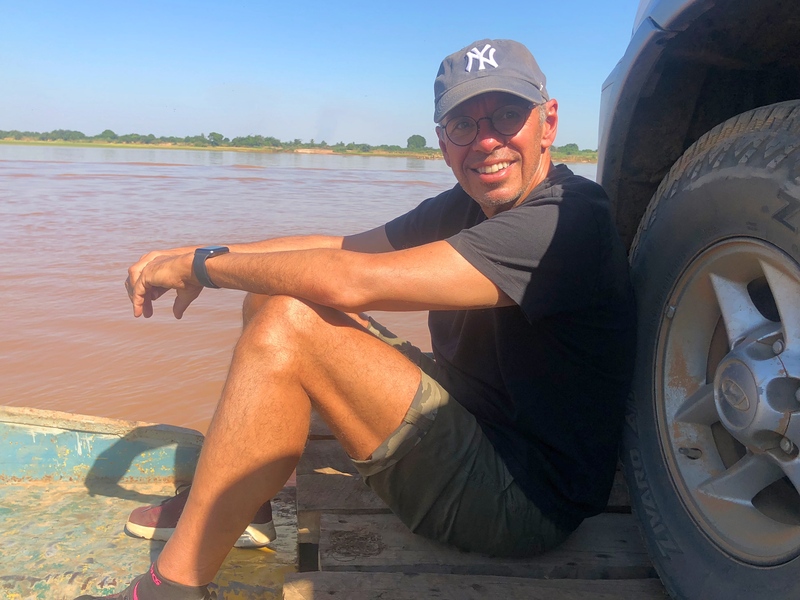 And this time back in Morondava I was feeling fine so I could enjoy our brief stop before a late afternoon flight to Antananarivo – visiting with friends we’d made in the park (a Bollywood director and his Bollywood actress wife! ), a long walk on the enormous beach, lunch at a nice Italian restaurant. Genuinely pleasant. 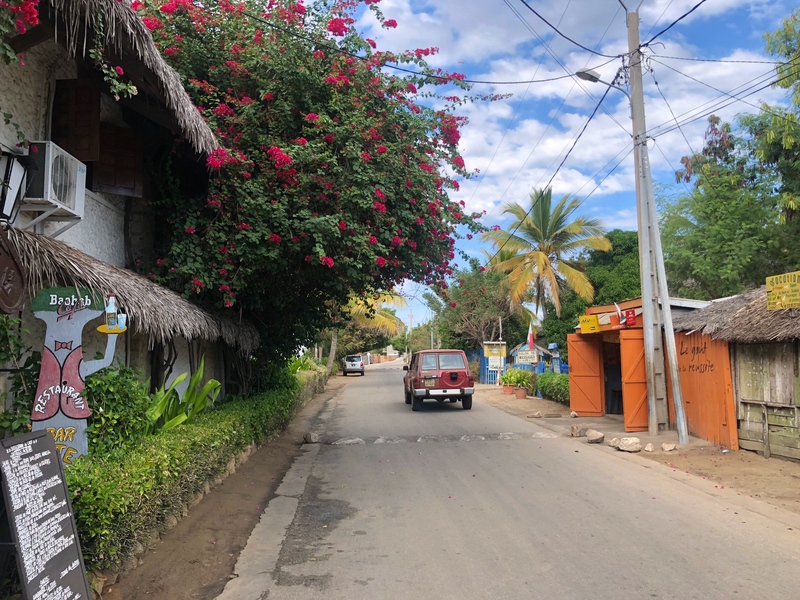 After another night in Tana we fly north to a beach resort which seems like a nice way to end our three-week trip through Madagascar. 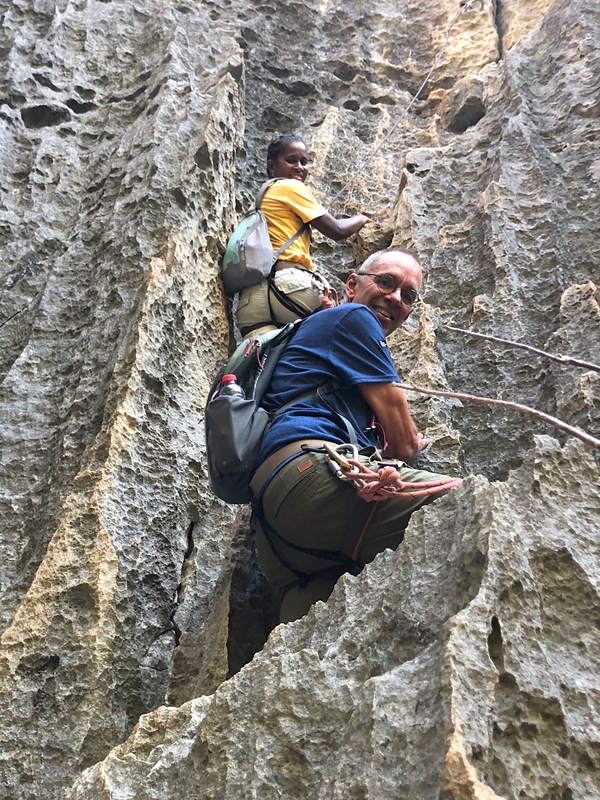 On one of the hikes we had the kind of gear that allows you to clip onto safety cables. Just in case, you know. 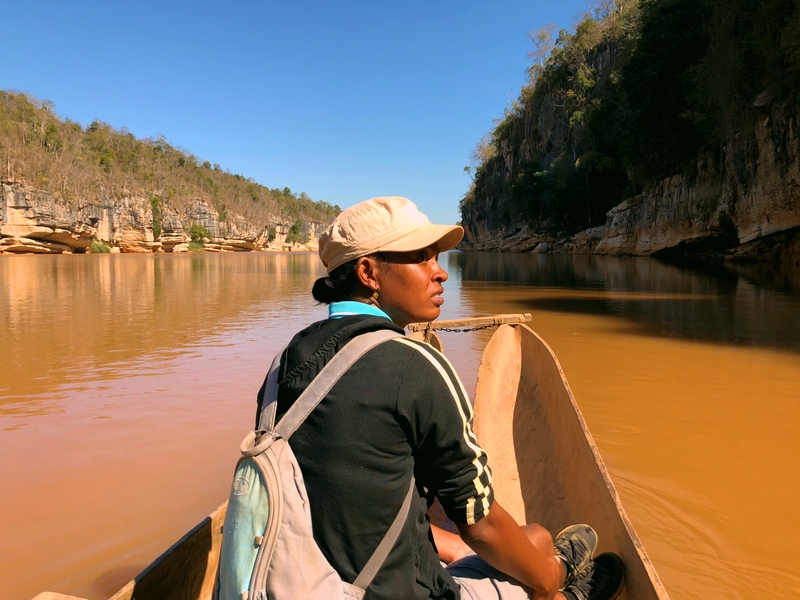 On the third day of our park exploration we took a boat maybe an hour upstream to get to our hike. 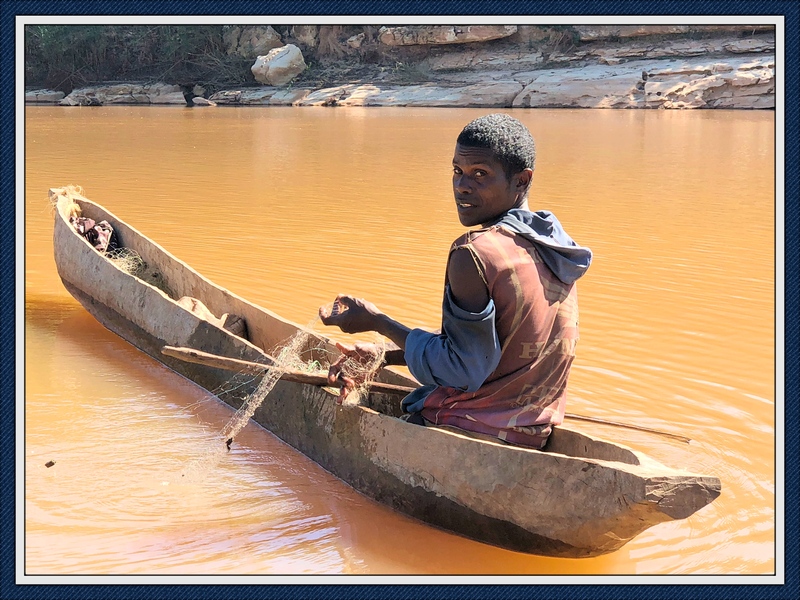 Riding on that remote, peaceful river like that was bliss. 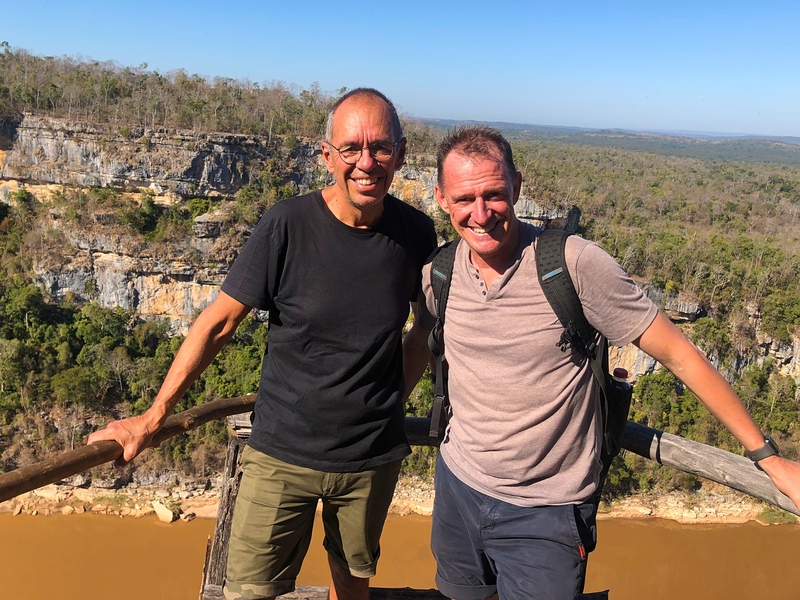 On each of our three days we would hike in the morning and then get back to the lodge for lunch. We were always the only ones there for lunch and then we’d head to the pool to relax. Felt very civilized. 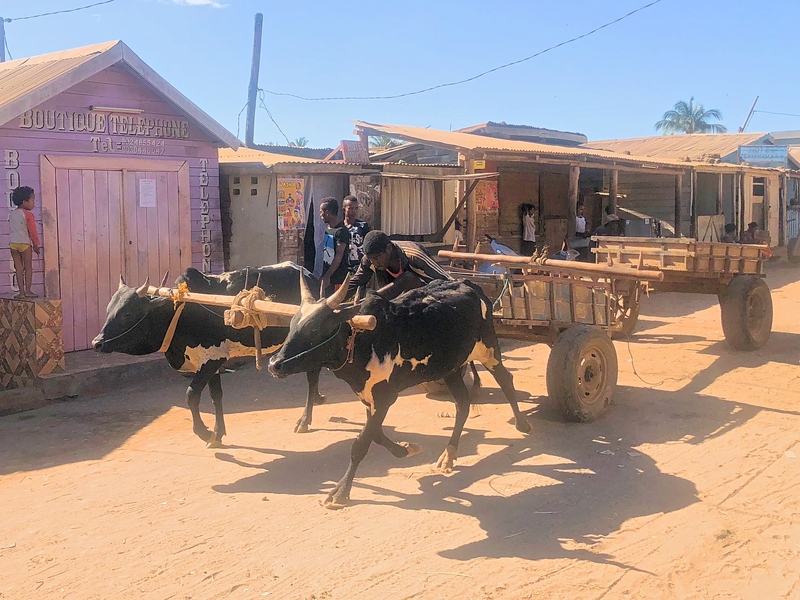 Certainly one of the highlights of the road trip to and from the park was our stop in Belo Tsirbihina, a tiny no-account town. Except for the oddly named Mad Zebu restaurant. 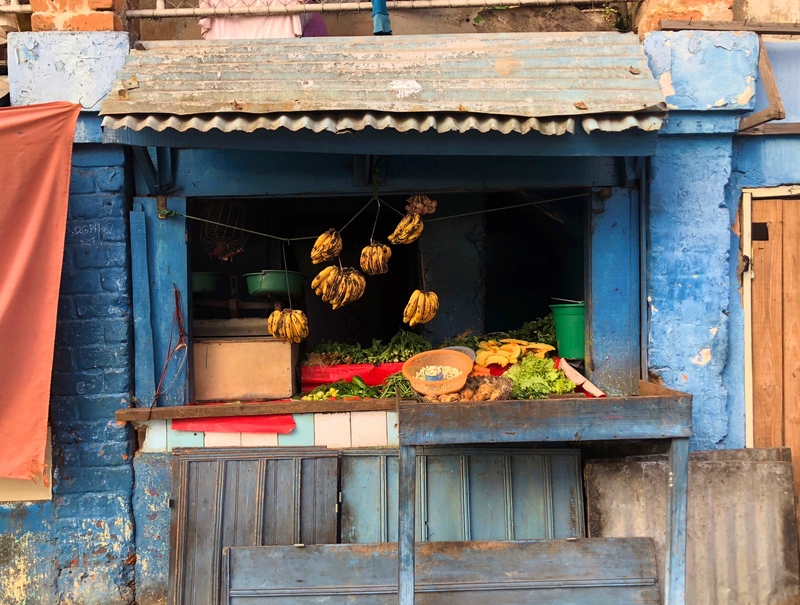 Here you are as close to the middle of nowhere as you can imagine and the most stunningly beautiful and delicious food you’ve ever imagined. 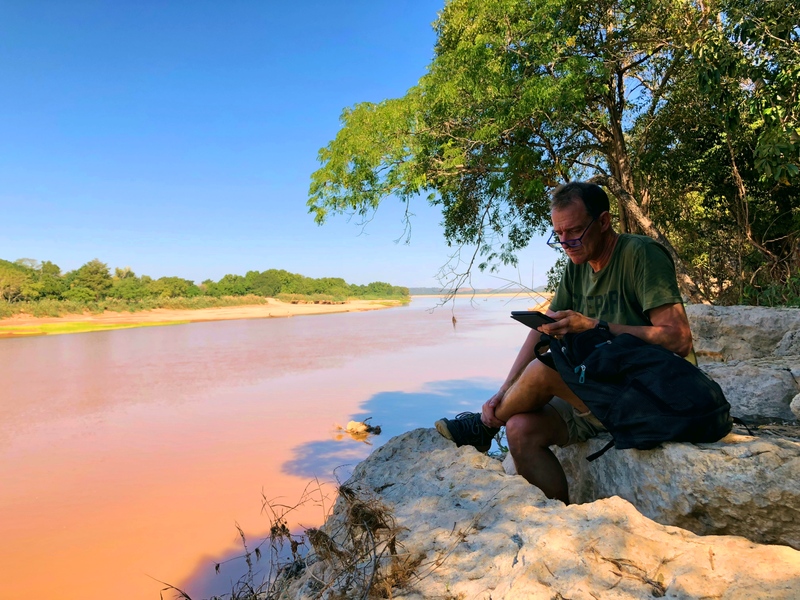 Roughly halfway between Morondava and the park, so perfectly positioned for lunch both in and out. Amazing. Another highlight of the road trip up and back was the two ferries we took in both directions. 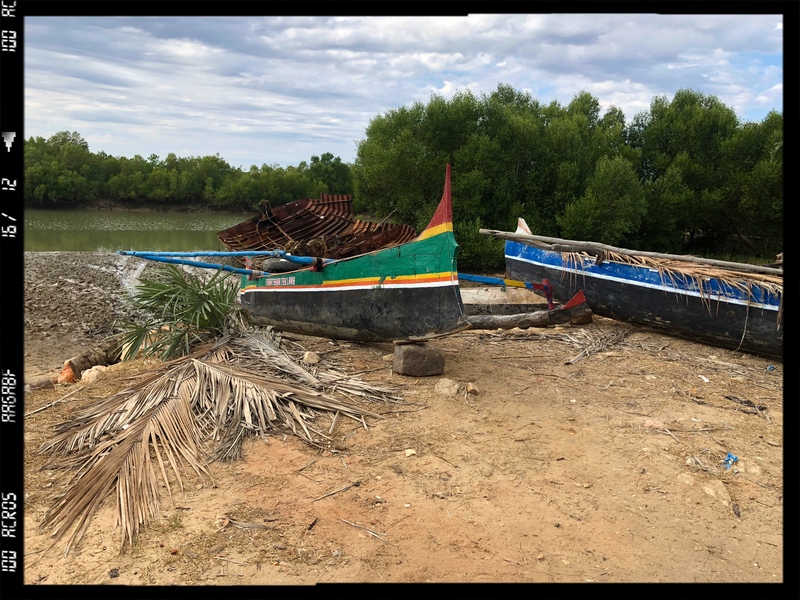 Nothing fancy about these boats…. You never give kids money, but sometimes you can give them pens. 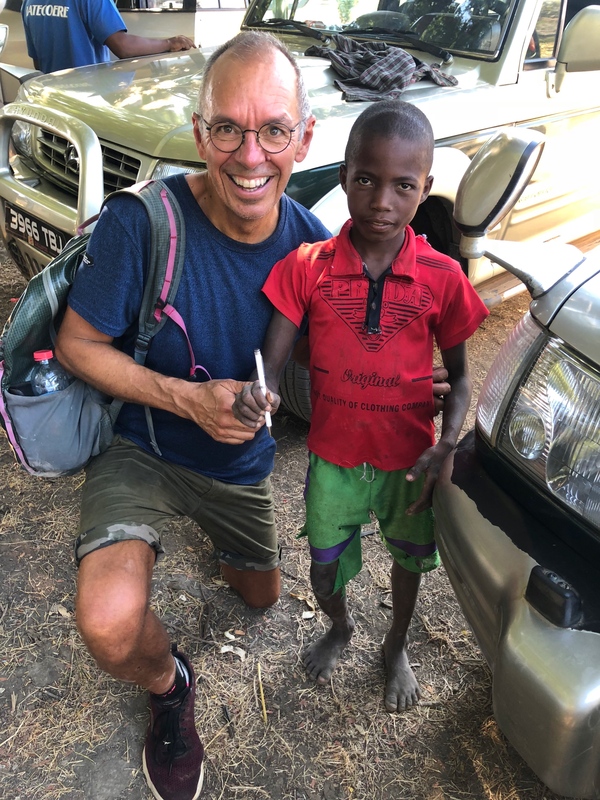 This little kid was cute and shy, but when I offered him this pen – from a St. Regis hotel! – he seemed pretty happy. 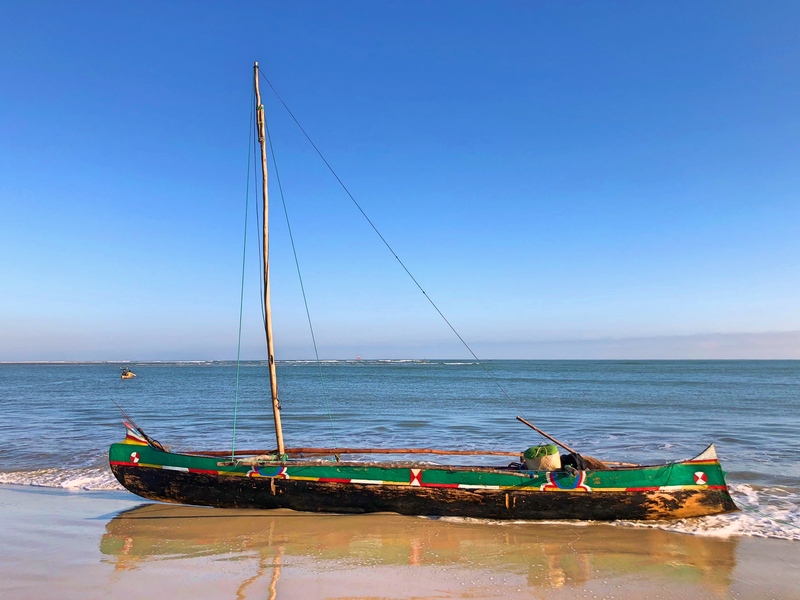 Our flight out of Morondava was supposed to be in the morning, but I still had time to walk down to the beach and enjoy the local scene. Then it was back to the room to pack, when we were informed the flight was going to be delayed four or five hours. 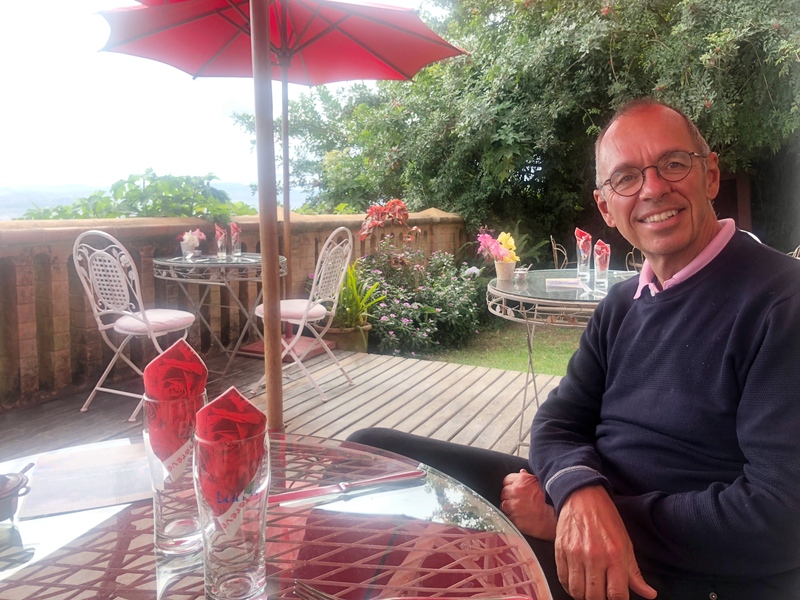 That turned out perfect; we had time to go back to our favorite Italian restaurant for lunch before heading to our flight back to Tana. 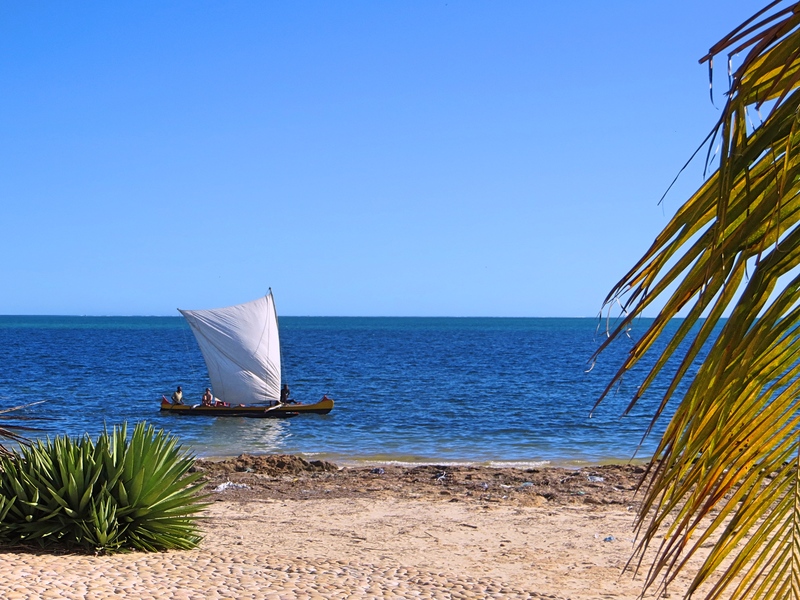 Our seventh stop in Madagascar was out on the west coast, two nights in the little beach town of Morondava. 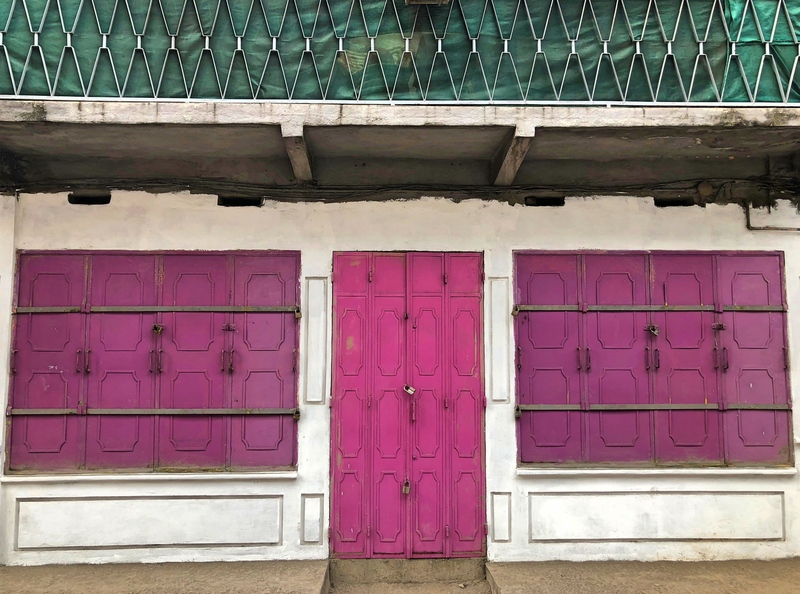 There’s not a lot to say about the town; for us it was mostly just a way-station on the way to Tsingy de Bemaraha National Park, one of those UNESCO-recognized sites we like. 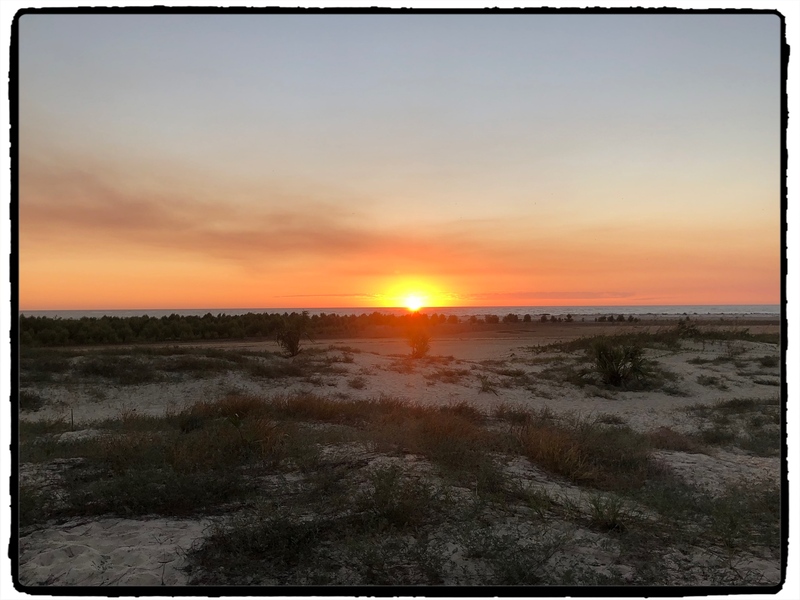 And then to make it more difficult to say much about Morondava, I managed to get nasty sick, something I ate or drank, the first night here. As a result our one full day here consisted of me lying in bed, miserable. 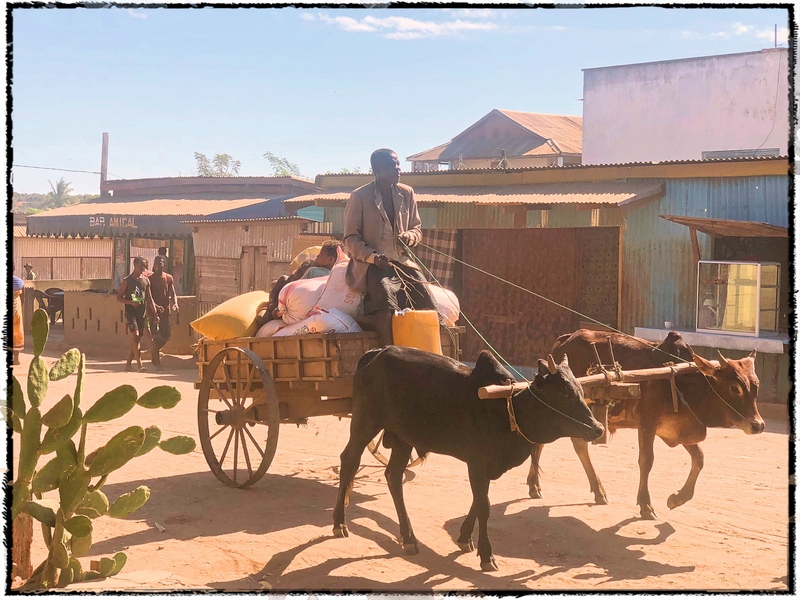 This isn’t the most flattering picture of Morondava ever, but it captures a piece of the town well. To be fair part of the town is ever-so-slightly touristy, reflecting a down-scale beach town, but there was more of this. The one notable site here was maybe 30 minutes out of town as we headed north to the park. 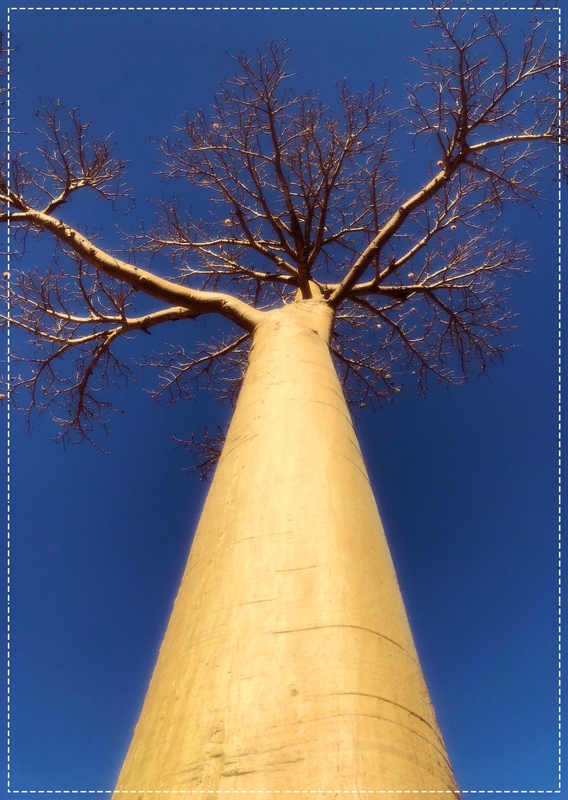 Avenue of the Baobabs is this iconic stretch of road (dirt road, as it would all be on the journey north) lined with baobab trees. 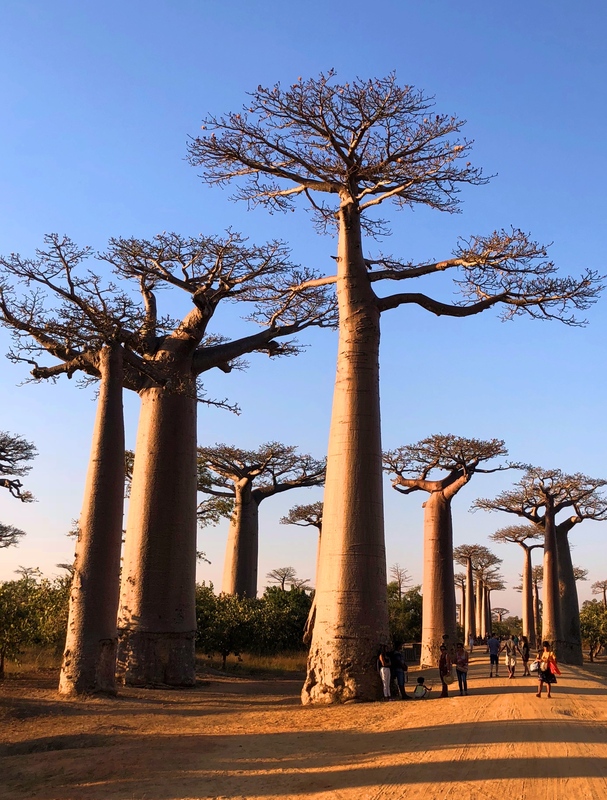 Perhaps the most photographed place in all of Madagascar, Avenue of the Baobabs creates an almost magical image of these unusual, endemic trees that can be thousands of years old. To be honest it doesn’t take long to appreciate them; a 15-minute stop on the road is all you need. But definitely worth seeing. Otherwise here’s a few pictures of the area. 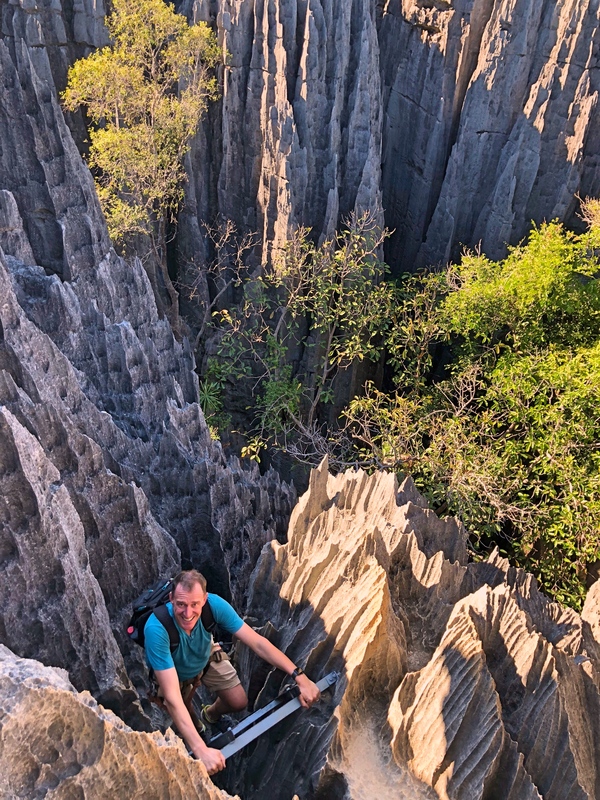 Teaser: there’ll be a lot more from Tsingy de Bemaraha when we get that posted! 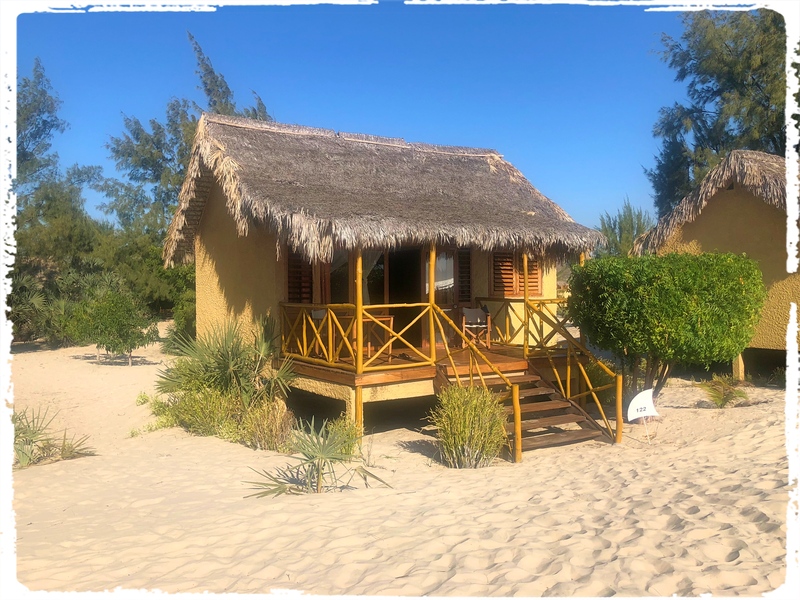 Our home in Morondava at the Palissandre Côte Ouest. You walked right out onto the sand but I never actually made it to the beach. 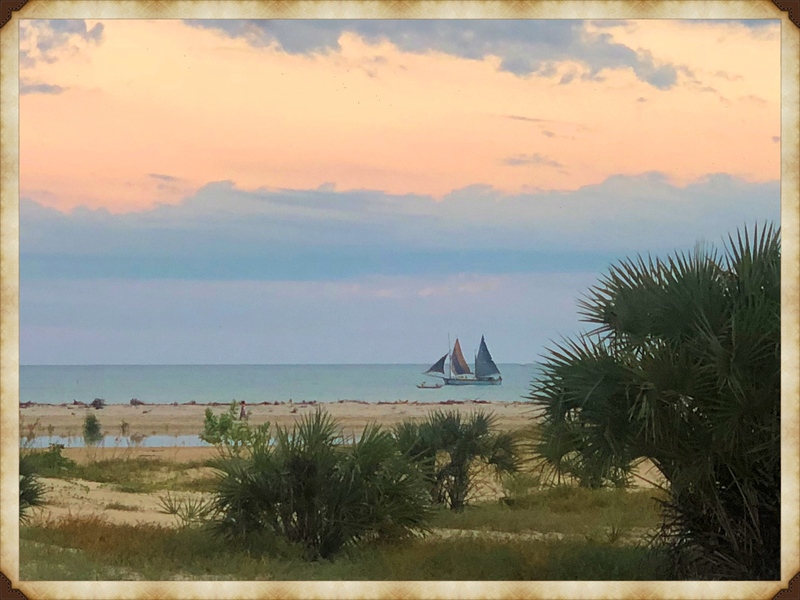 In part that was because I was sick, but even more it was because the beach itself – that is, the place where the water hits the sand – was probably a quarter mile away. Definitely the deepest beach we’ve ever seen. Lunch at Dunes d’Ifaty in Mangily. We hadn’t planned on spending the night here but we’re glad we did. 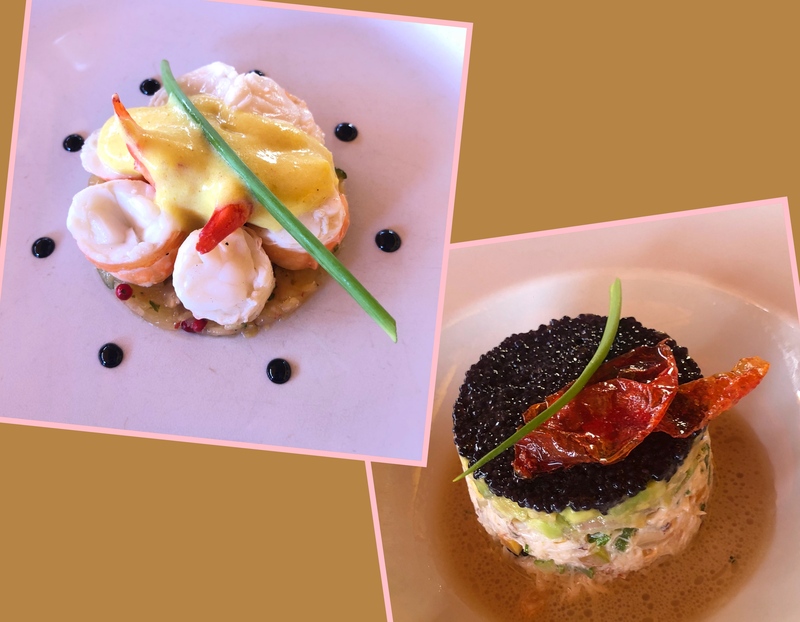 My Niçoise salad was great and after this first course Mark had lobster! 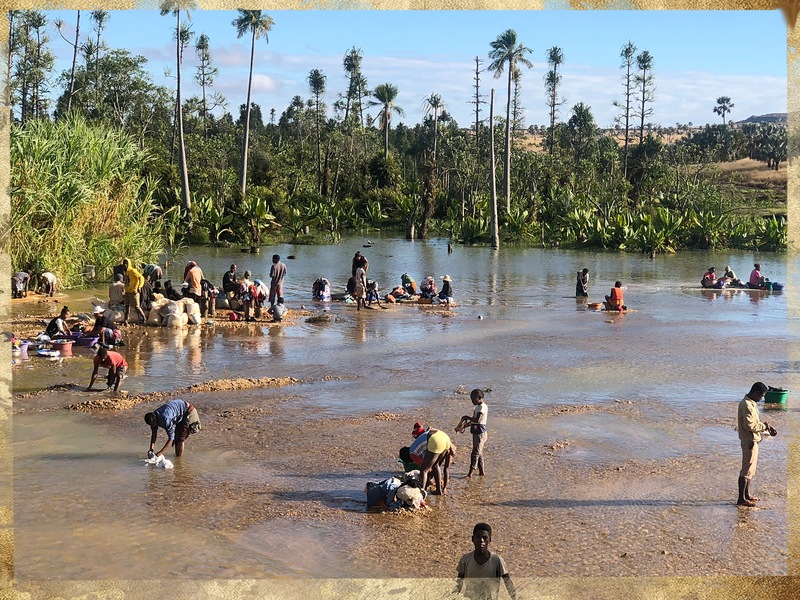 As we move down into the deep south of Madagascar we are reminded that this is the seventh-poorest country on earth; the poverty now really smacks you in the face. 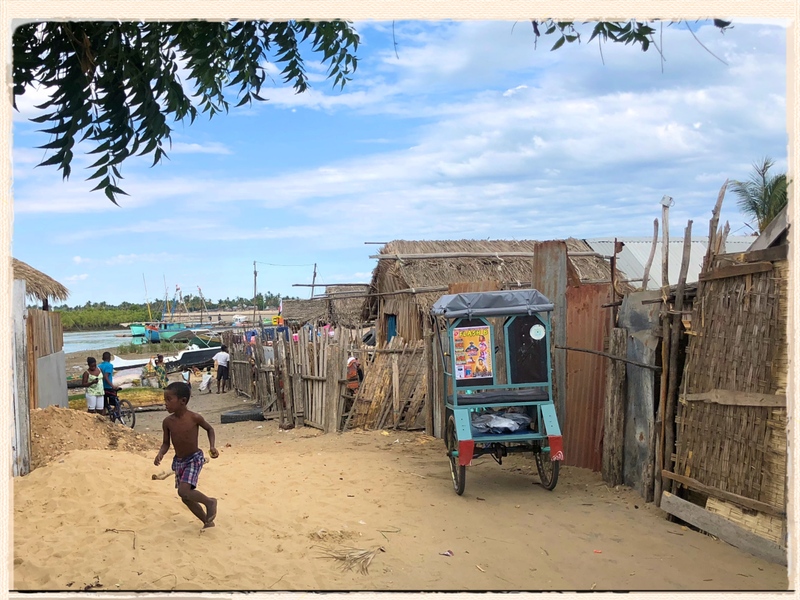 The huts, the fields, the clothes – all just substantially more obviously barely scraping by. 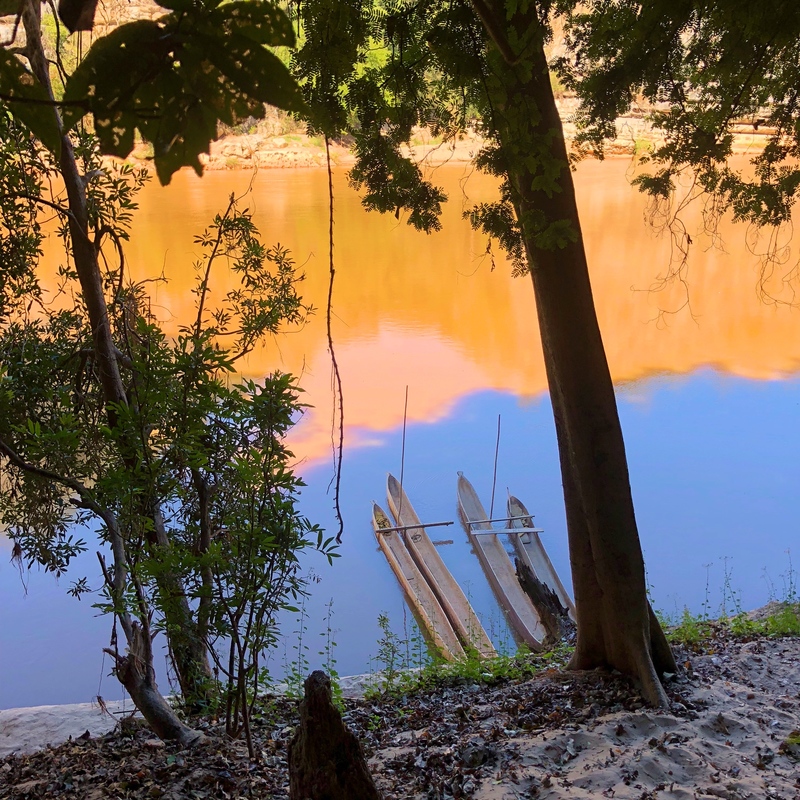 The last place we particularly wanted to go in the south was Islao National Park. From there we wanted to go to the west-central part of the country for a little beach time and another national park. 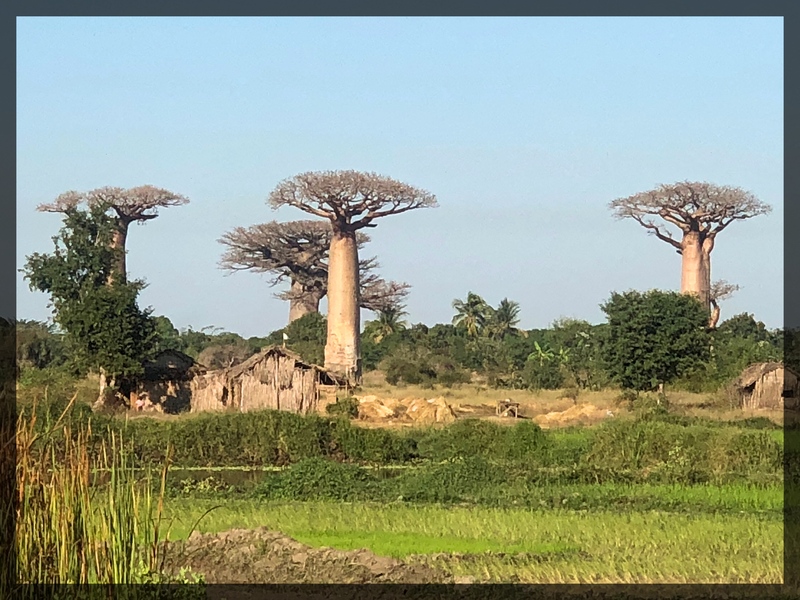 Given the condition of Madagascar’s roads, though, you can’t just turn north and drive; you have to fly back to Antananarivo (or drive back, but that wasn’t very appealing) and then fly out the next day. 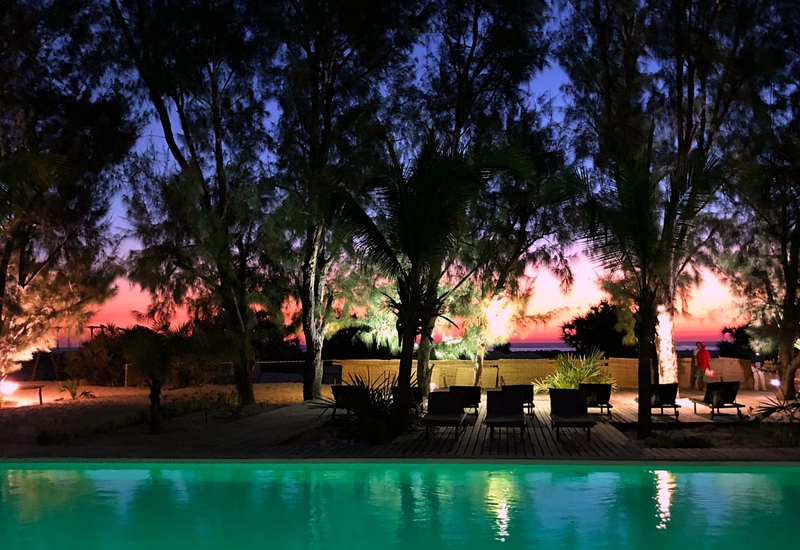 So the plan was to spend four nights at Islao and the next drive four hours to Toliara for a flight back to the capital; as the flight wasn’t scheduled until after 3:00 PM that would work just fine. 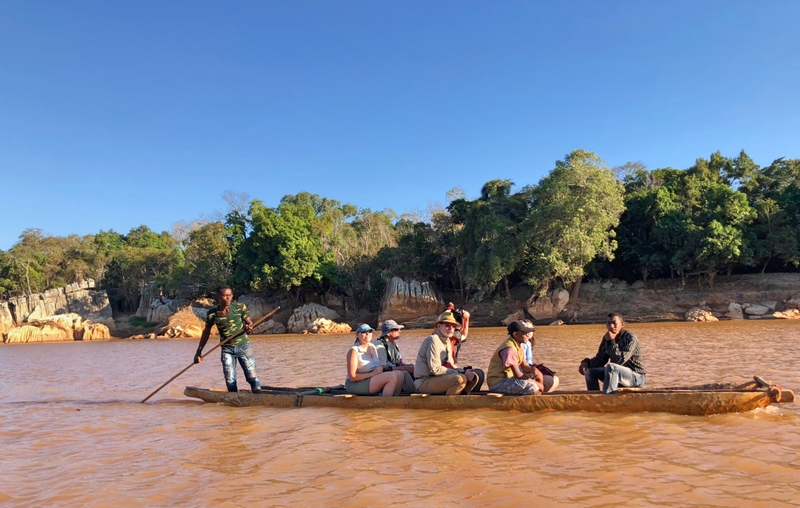 That is, until our guide explained that while the schedule said a 3:00 PM departure, in fact they would contact us the night before to tell us the real time and that it was likely to be early in the morning. 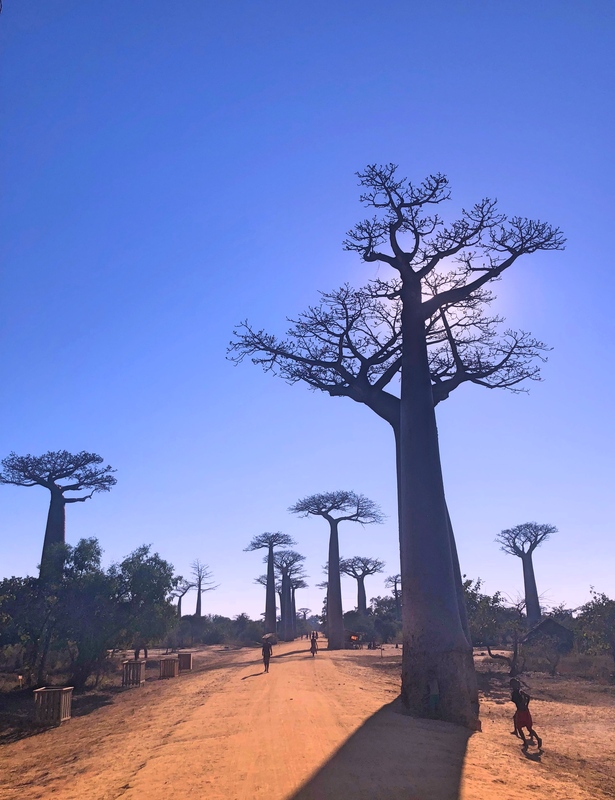 So we cut short our Islao stay by one night and drove out to Toliara for the night. A pretty nice beach here in Mangily. For what it’s worth technically that’s the Mozambique Channel, with Mozambique maybe 250 miles out. In the scheme of things all that worked out great. 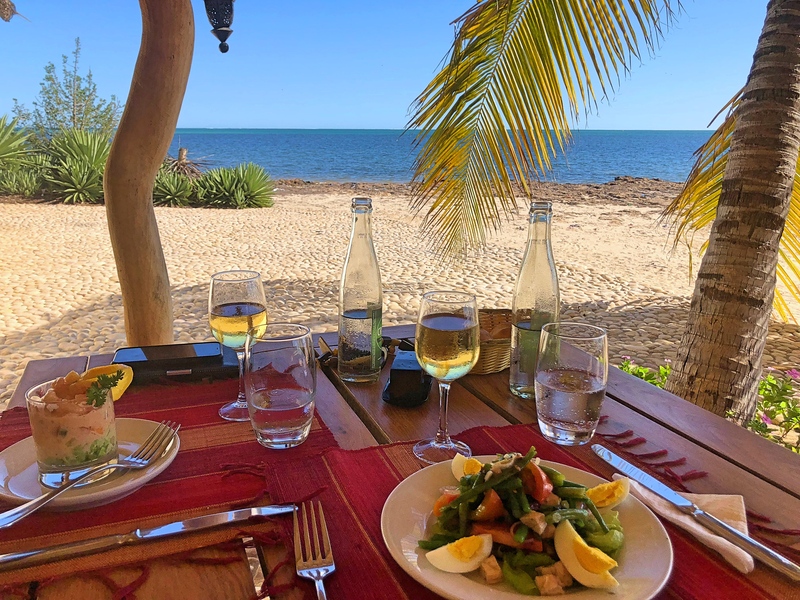 We ended up – at our guide’s suggestion – at a simple, beautiful seaside place maybe 45 minutes up the coast from Toliara. 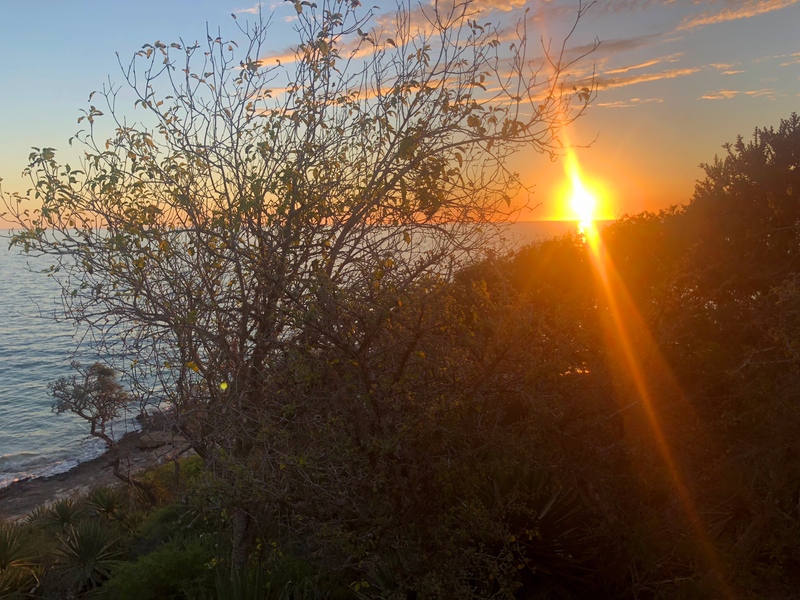 We had a pleasant little villa with a nice porch facing the ocean and a couple of great meals. Mark had a lobster lunch and I had a couple hours reading on the beach so we were both pretty happy. And then we got the call that indeed, the flight was going to leave at 8:00 AM, not 3:00 PM. That seems a strange way to run an airline but it worked for us. 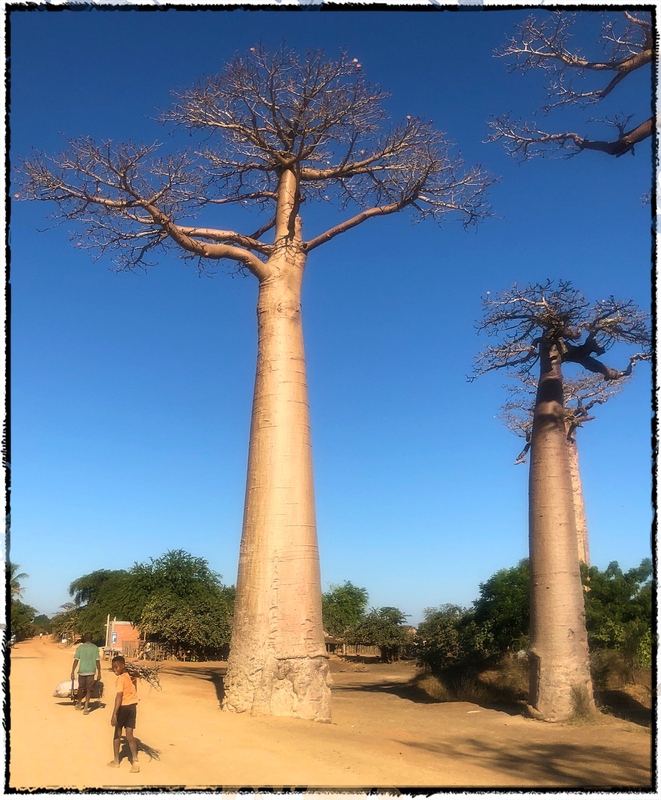 So the next morning we had to get up at 5:00 AM for the drive back to Toliara; they want you at the airport plenty early. The airport meant farewell to Bio, our driver; he was taking two days to drive back to the capital. This was the first time we’d hired a driver for an extended tour like this and it worked really well. Bio was just about perfect: he drove well, chatted some but not too much, and stopped to show us places that were genuinely interesting. Can’t ask for more than that. 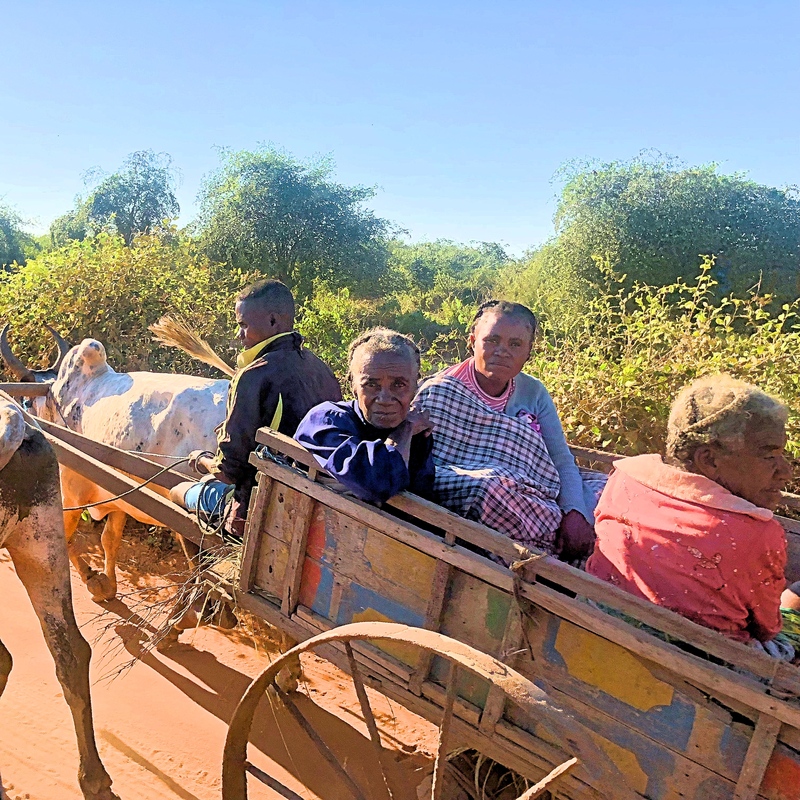 One thing about driving in Madagascar that I really liked; the dog that didn’t bark. 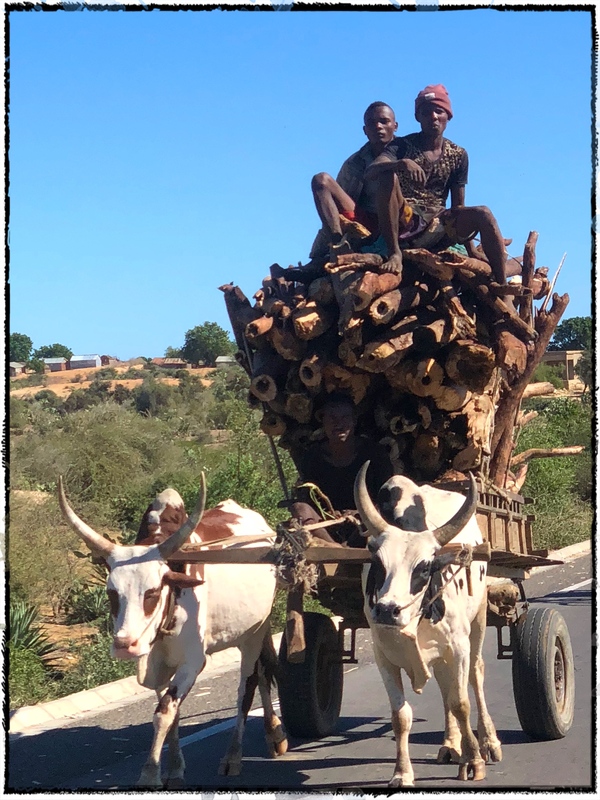 It took me a few days to realize that unlike many lower-income countries where we’ve traveled the locals here aren’t addicted to their horns. 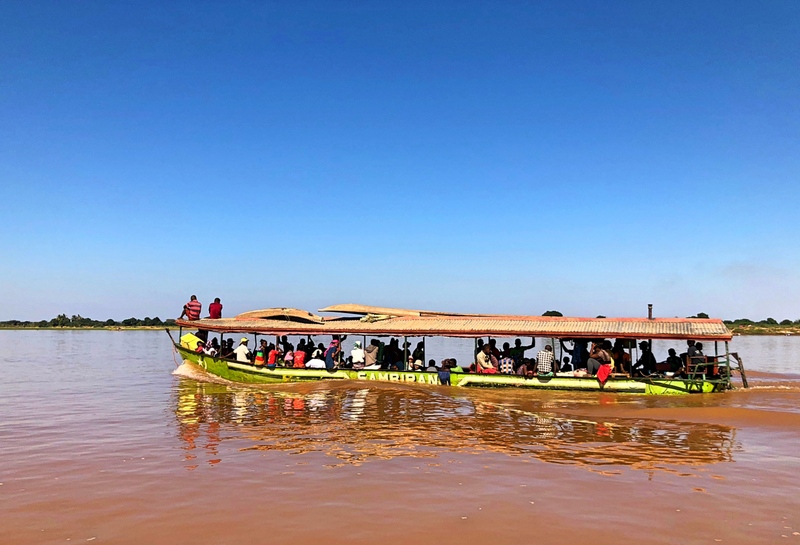 We’ve been places – Cambodia in particular comes to mind – where the blaring of horns is just overwhelming. Here, not so much at all. 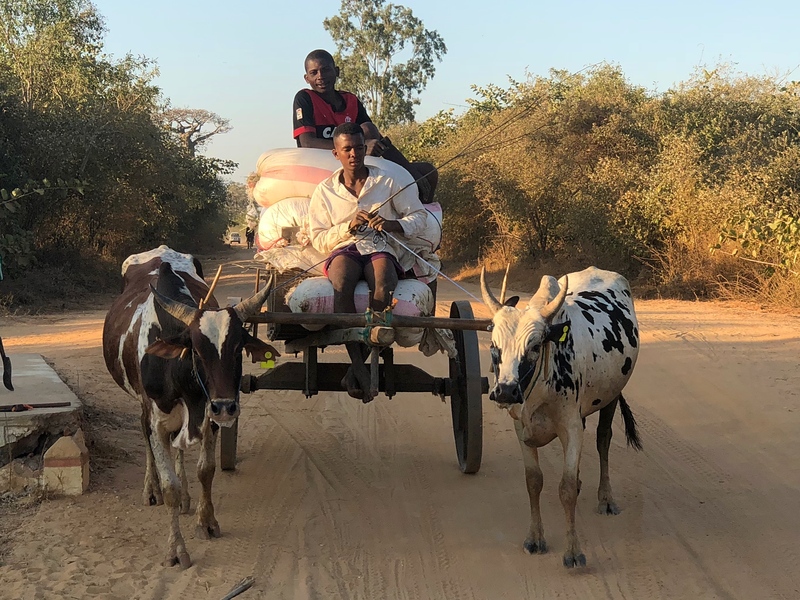 The roads are shared with zebu and pedestrians and rickshaws and all sorts of animal-pulled vehicles so there’s no shortage of encounters at varying speeds. When someone needed to alert others, though, it was a gentle little tap on the horn, not a screeching noise. Made for a pleasant multi-day drive. 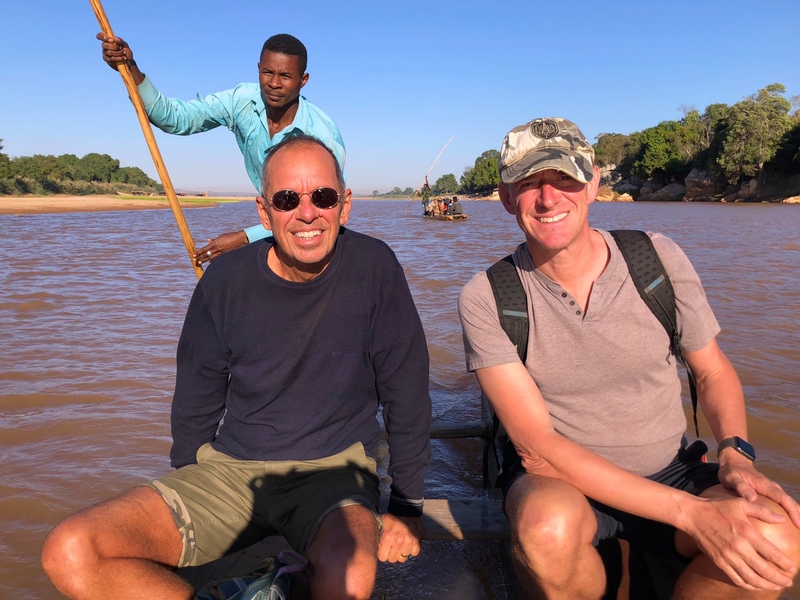 As for the commute to Antananarivo, this was a little domestic flight so security was modest: a guard looked inside my carry-on bag and just waived me through, no scanning or anything else. 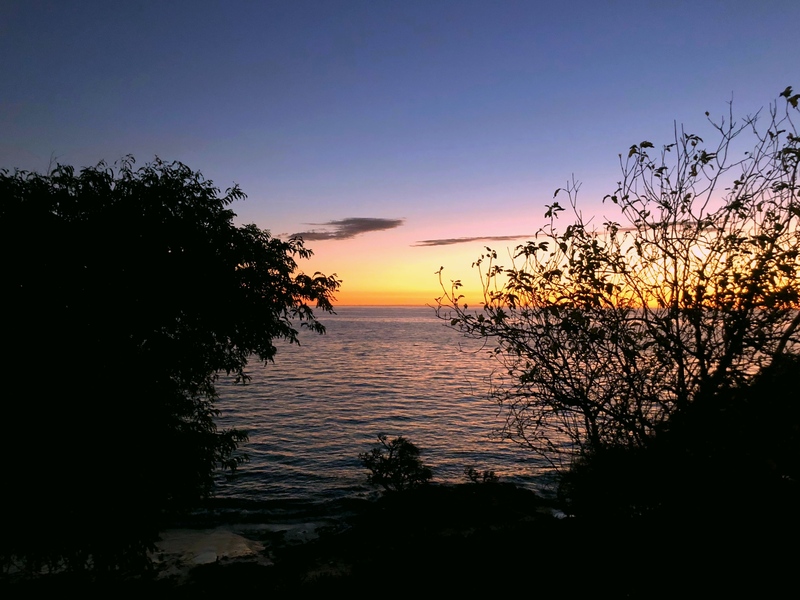 Eventually that non-stop flight we’d booked took off … and stopped. 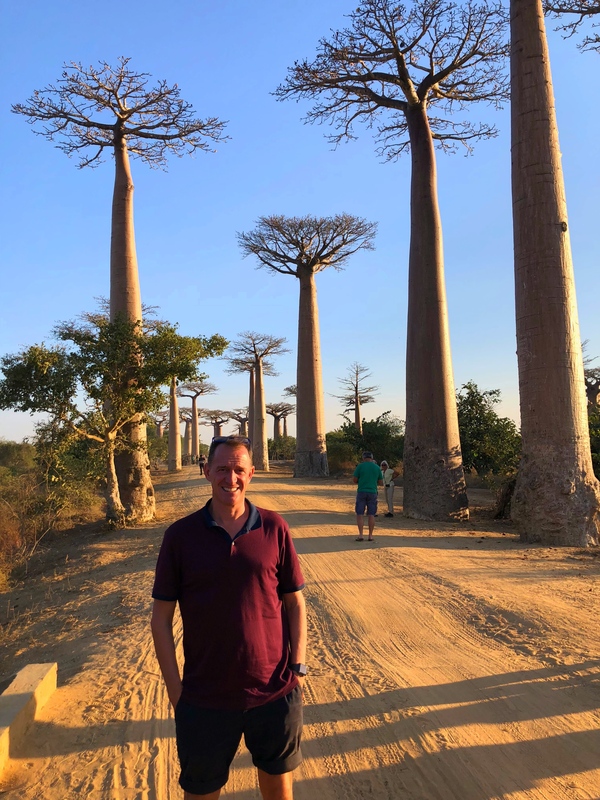 At a city well out of the way of our route to Antananarivo. When we finally got to the capital we couldn’t believe how long it took to get our luggage. 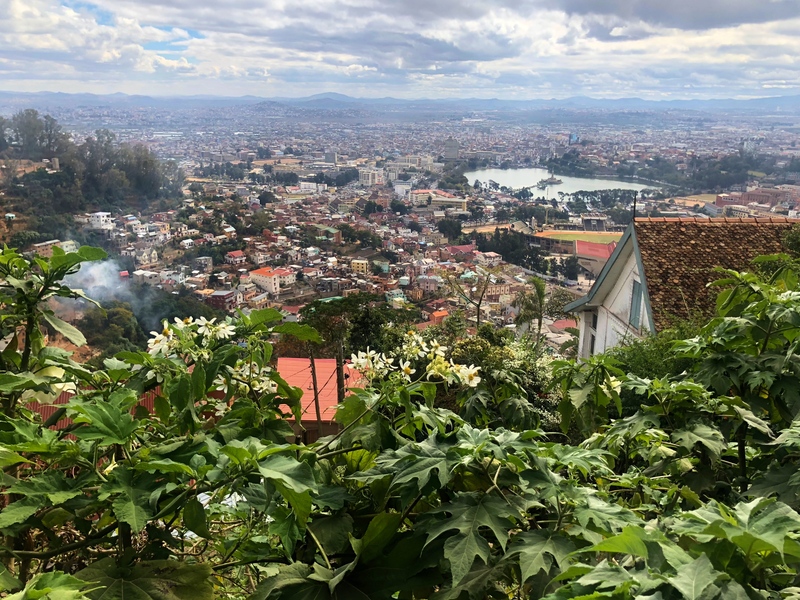 And then how l-o-n-g it took to drive to our hotel; the traffic in Antananarivo – that day at least – was pretty horrible. This, too, was just a one-night stop but we enjoyed it. We stayed at a little place way up the hill near the Queen’s Palace that we’d toured on our first stop in the city so we had an amazing view of the city. While out searching for an ATM – lots of places in Madagascar don’t take credit cards and the ATMs only disperse about $125 at a time (in $3 bills), so searching out ATMs is a constant here – I even chanced by an Italian restaurant that we went to for dinner that was a treat; it was good on its own terms but particularly good for a change of pace. 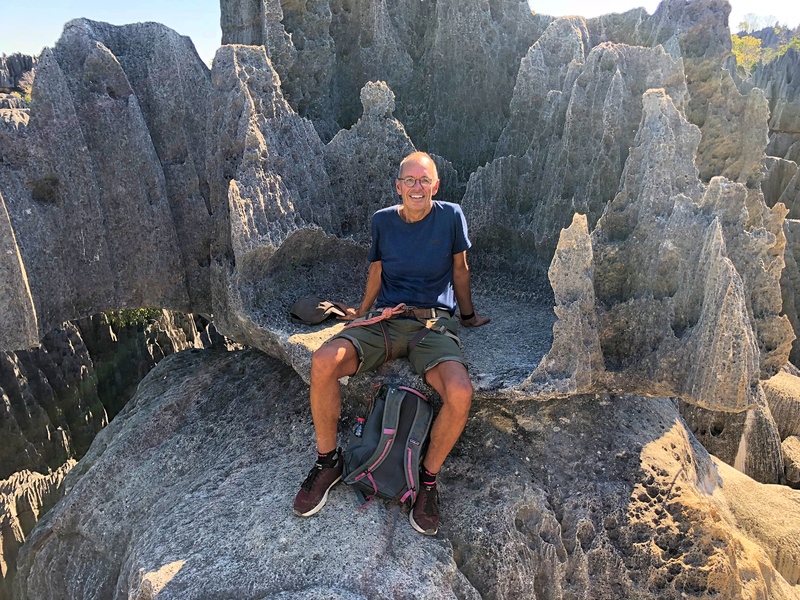 From here we fly out west for a week – a little beach time and then out to Tsingy National Park. 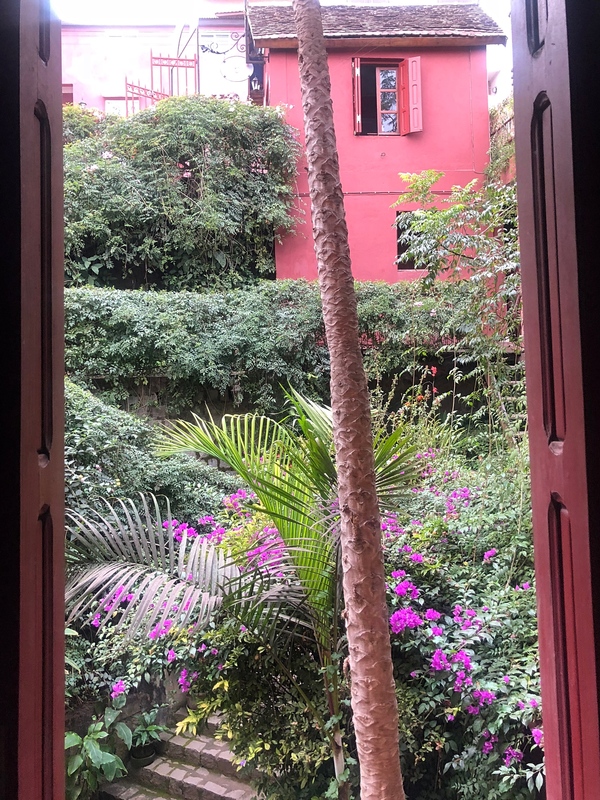 Looking out our window at the hotel’s lush gardens. I’m pretty sure this was the view out the bathroom window!